Interested in a new racquet? If you want to try before you buy we can help. 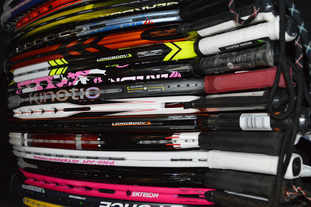 We have a large variety of demo racquets for you to test out before your next purchase. Not only do we carry the latest and greatest racquets available, we also have racquets specific to your needs. We will come and bring the new racquets for you and your friends to try out. Inquire about trying some racquets today!